Nigeria is a country in Africa located on the Gulf of Guinea. The climate is very tropical, characterized by two distinct seasons: the dry season is during the winter months and the wet season lasts from April to October. Nigeria's climate is suitable for many different ornamental plants. 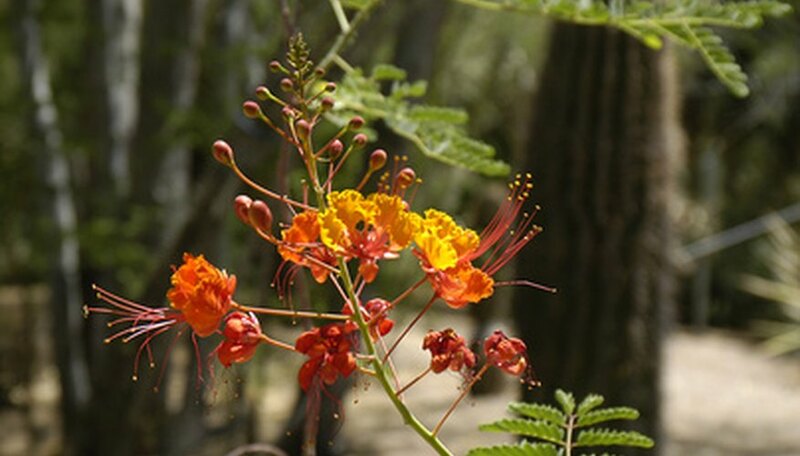 Red bird of paradise (Caesalpinia pulcherrima) is also known as the pride of Barbados. It is a perennial evergreen plant that can grow up to 15 feet tall. The flowers bloom in spring and are very showy. They are orange-red and grow in clusters to make the bush appear like it is on fire. The red bird of paradise prefers full sunlight and infrequent deep waterings. Rattleweed (Crotalaria retusa) is an herbaceous, annual plant that is native to Africa. It is also referred to as the rattlebox or wedge-leaf. The plant can grow nearly 36 inches tall and is a member of the pea family. The flowers are showy and yellow in color with purple lines along the stems. They bloom in spring. The rattleweed gets its name from the pods that grow beneath the flowers that rattle when they have dried due to the seeds inside. The plant prefers full sun and moist, well-drained soil. Flame of the woods (Ixora Singaporensis) is also referred to as the jungle flame or jungle geranium. It is a round perennial shrub that has large clusters of bright red flowers in the spring. The flowers can also be yellow, pink or orange. It is often used as a border shrub or hedge. The flame of the woods belongs to the same family of the coffee plant and the begonia. It prefers rich, well-drained soils and full sun to light shade. Queen of night (Tulipa) is a perennial flower that produces a rare, deep purple-black flower, late in the spring. The stems of the flower can grow up to 30 inches tall. It is most often used as a border or edging flower due to its large display of color. It can also be grown as a container or window box plant. The queen of the night is a hardy tulip that prefers well-drained soils and partial shade.